The character selection screen from Injustice: Gods Among Us has apparently been leaked. This image (via OG) reveals the final two characters on the game's roster: Killer Frost and Ares. Ares should be familiar to you Greek mythology fans. He's the Olympian god of war. He has superhuman speed and strength. Centuries of warfare have made him skilled with every weapon known to man. The comic book version of Ares was an archnemesis of Wonder Woman that could wield weapons with telekinesis and shapeshift at will. Killer Frost is a supervillain as well. She has various ice-based powers at her disposal. She can, for example, create weapons out of ice or perhaps a defensive shield. She can also freeze living beings that she touches. It's not hard to imagine how these powers would be implemented in a fighting game. Injustice: Gods Among Us has a roster of 24 characters, half villains and half heroes. Marquee names like Superman and Batman are joined by somewhat lesser-known characters like Black Adam and Hawkgirl. 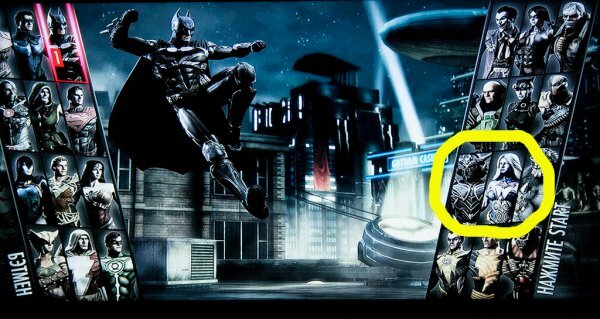 Several other charactwrs from the DC universe will also make appearances in cutscenes. NetherRealm will release Injustice in April on the PS3, Xbox 360 and Wii U.